Life has an unusual way of throwing curve-balls at a person. I have spent the past weeks using pencils of various sorts in an attempt to find the passion some have for the Graphite. After an exhaustive use and having nearly experienced a breakdown due to ink withdraw, I have come to the conclusion. I am not fan of graphite for everyday use. Another thing I noticed quickly after using a pencil was that I gravitate towards printing my words rather than writing in cursive. I noticed this while taking notes during a conference call at work. Flipping through my notebook supported this. There was a noticeable change in the way / style I wrote. Looking back I attribute this to when I took drafting in high school. That was the days before CAD became the norm. We drew everything by hand and one’s hand-writing was imperative to understanding a document. Though I can honestly say my hand-writing is now where near the level of The Pen Addict himself…I pale in comparison. I also discovered I have a particular lead range I prefer. No harder than HB and no softer than 3B, optimally staying in the 2B range for everything. I also prefer mechanical to wood cased. I believe that would change if I were to try a Blackwing. I really wanted to try one out but, could not justify a $20 purchase for a test…especially since I felt strongly I wouldn’t stick to pencils. Finally, I realized I could not find a pencil I really liked again, the Blackwing may have changed this. I continued going back to my green Pentel P205 0.5mm with 2B lead. Because of this experiment I have incorporated the Pentel into my EDC and use it for specific purposes. It is nice to have especially in wet weather and when I don’t want to worry about ink leaking. My writing style has also changed. I no longer write everything in cursive handwriting. My notes are printed when I am on conference calls or in meetings and depending on the note I will vary my script form print to cursive to add emphasis. 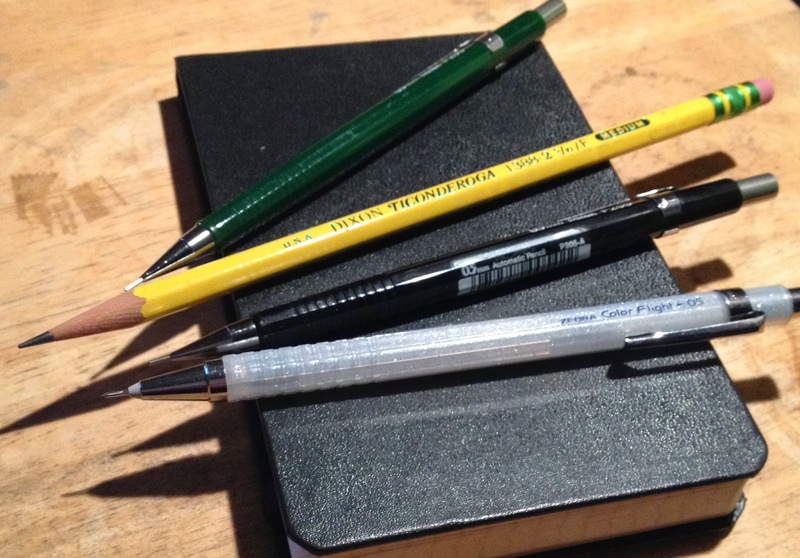 For those who are strict pencil users, my hat’s off to you. I just couldn’t continue writing my notes and such in graphite…it’s a mental issue and I am seeking counseling. Admission is the first step. Great post. You definitely took me down memory lane because my profession is not a pencil friendly one. I have dubbed myself a "ferpectionist," acknowledging that I will never BE perfect, no matter how much I try. It makes me very fond of pencils and erasers! I recently found out that I have a deep appreciation of the mechanical pencils of the early 1900's to about mid century. The ringtop Whal Eversharps are great for me because I am fairly petit. Also, pocket size is directly proportional to the size of one's garments. Mine are practically useless. The ringtops fit into my pocket and the annoying clip never gets in my way. Your post took me right down memory lane. Thank you for the fun!